Yes, as all scenic train, bus & ferry services in New Zealand are 'Reserved Seating/One Class' services, so it is recommend that you make a reservation in advance, as there is no guarantee that there will be seats available on the day you want to travel. How do I pay for my booking or pass? You can pay for your booking or pass by a Visa or Mastercard debit or credit card which will incur a 2% fee. If you live in New Zealand you can also pay via direct credit to our bank account by selecting the Account2Account and paying from your account directly into ours. How do I receive my ticket ? You will be travelling on an ‘Electronic’ Ticket which is emailed to you, so there is no need to have a ticket. It is strongly recommended that you print out your ‘E-Ticket’ and include it with your other travel documents. Failure to do so, may result in disruption of your travel plans and additional fares to be paid. Valid photo ID may be required on check in. Free checked luggage allowance is 1 item per person, with a maximum weight of 32kgs. Bags weighing over 23 kgs will require two crew members to lift onto the train, you may be asked for assistance. Wheeled cacbin bags and backpacks are classed as check-in luggage. Two additional items of baggage can be purchased for $20 including GST per piece. Each fare paying passenger can take one small hand bag and/or personal items such as camera, coat, etc, on board. Passengers are responsible for all carry on luggage. Unaccompanied luggage will not be carried on any long distance passenger train services, bus or on any Cook Strait ferry service. All luggage should be covered by independent insurance. Bringing your bike, board, skis or baby buggy aboard is fine, but space is limited. There will be an additional charge for carrying extra items like surf boards, bicycles or skis. Because of space demands, bicycles will be limited to four per train service and we recommend that you book your bike on in advance to secure a place at $10.00 per bike. You may also be requested to remove, fold, or cover some parts of your bike. Bicycles must be collapsed down (both wheels removed from the frame) with handlebars turned sideways and the chain covered. Bicycles presented in this fashion will be accepted for travel and counted as one of your two Checked Luggage entitlements. If your bicycle is not collapsed down then it will be regarded as Oversize Luggage. f you are bringing a bicycle that is not collapsed down, please contact us in advance of travel so we can inform the driver. This may make it easier for him/her to leave space for your bike, although we cannot guarantee carriage on any specific travel date or service. Please see the oversize luggage information above regarding services which are unable to accommodate bikes. st of other traveller’s luggage and driver safety, all bicycles must have the pedals removed and the chain covered. The charge for bicycles that are not collapsed down is $10.00 per bike, per individual bus connection. This is payable to the driver. If the wheelchair or mobility scooter cannot be collapsed down to fit the Checked Luggage size and weight dimensions, then the Oversized Luggage policy applies. Sporting equipment, such as surfboards, golf clubs, canoes and bicycles, can be carried on our vessels, for an additional cost of $15 per item. Animals or pets are not permitted on any long distance passenger trains or bus except for seeing-eye dogs. Long distance passenger train, bus or ferry services do not carry un-accompanied luggage or freight. Pets (except for see-eye dogs) are not allowed in the passenger areas of any Cook Strait ferry. Other animals can be carried on any Cook Strait ferry but are subject to the terms of carriage of the ferry operator. Train, Ferry & Coach staff are highly trained in supporting passengers to make their trip enjoyable. Under New Zealand law all long distance passenger train and bus services are non smoking services. There are short smoking stops at various points within your journey where you can stop, stretch your legs. On Cook Strait ferry services, there is a smoking area on each ferry. Do I need to have travel insurance ? It is recommended that you have travel insurance when travelling, to cover your luggage, personal belongings, medical/hospital care and trip disruption and trip cancellation. If you have medical insurance in your own country, please check with your medical insurer as to what level your insurer will cover you to before leaving your country. If you require travel insurance or require to top up your medical/travel insurance, please contact your professional travel agent for advice. Seating assignment on all long distance passenger trains services is done on ‘Check In’ on the day of travel. Seating requirements can be requested at the time of a reservation being made. Any seating request can not be guaranteed unless it is for medical reasons. Final check in time for all long distance passenger train services is 30 minutes before scheduled departure time. Final check in time for foot passengers on a Cook Strait ferry service is 45 minutes before scheduled sailing time or 1 hour for passengers taking a vehicle. Final check in time for bus services is 15 minutes before scheduled departure time. Are meals included in my train fare? Meals and/or refreshments are not included your train fare. You can pre purchase meals before you travel, please contact us for details. Each train has a Cafe Carriage, where you can purchase alcoholic/non alcoholic drinks, snacks and light meals. What is the age of children? A Child is from 2 years up to 14 years travelling with an Adult. A Child under 14 years must be accompanied by an adult or guardian 18 years and over and can not travel by alone. If a Child aged 14 years or younger travelling with an adult or family, a ‘Child’ fare applies. If travelling alone, an ‘Adult’ fare applies. An infant is a child 1 month to 23 months travelling with an adult (Over 18 years) being a parent or guardian. An infant must be carried on the adult’s lap in order to travel free. If a seat is required, then a ‘Child’ fare must be paid for. Infants must be named at time of booking as passenger numbers are limited. A Child is from 3-12 years travelling with an Adult. An Infant is a child 0-3 years travelling with an adult (Over 18 years) being a parent or guardian. An infant must be carried on the adult’s lap in order to travel free. If a seat is required, then a ‘Child’ fare must be paid for. nfants must be named at time of booking as passenger numbers are limited. No, there is currently no processing fee for online bookings, however a fee maybe charged for help via the phone or chat service. Should you cancel a processing fee will be charged on top of any cancellation fees charged by the operator. Are there toilet & washrooms facilities onboard? All long distance trains and ferry services have toilet facilities onboard. InterCity bus and coaches do not have onboard toilet/washroom facilities except for the Starlighter over night services. All Great Sights and most Newmans services have a onboard toilet & washroom facilities. Can I be dropped off at my accommodation from my bus journey? Long distance bus and coach services do not drop you off at your accommodation. Most stops in major cities are within close proximity to all the main backpackers and hotels. Can I travel if I am disabled? If you have special requirements, require accessibility assistance please call us to discuss your needs so we can help make your journey as comfortable as possible. For train travel, mobility-impaired passengers, wheelchair hoists provide access to the café car from platform level. Up to 2 spaces for wheel chairs are available in the cafe car, and each cafe car has a disabled public toilet as well as a hearing loop for hearing-impaired passengers. For ferry travel, mobility-impared passengers can be accommodated. Interislander takes very seriously its responsibility for the safety and comfort of all passengers. While onboard ask any of the crew at any time for assistance - they are only too happy to help. What is a train day on my pass ? Christchurch/ArthursPass/Christchurch, Christchurch/Greymouth/Christchurch, Christchurch/ Kaikoura/Christchurch or Christchurch/Picton/Christchurch). or one way ‘Ferry/Train’ travel from Christchurch to Wellington, Kaikoura to Wellington, Wellington to Kaikoura or Wellington to Christchurch. How do I book my Rail or Bus Pass travel sectors? To make individual train, bus or ferry travel reservations please contact our New Zealand Travel Team. Details will be shown on your pass. When you receive your Rail or Bus Pass it is your responsibility to check all details / dates are booked correctly. If you need to make changes to your ticket, please contact us immediately as space is limited and subject to availability. Can I change the dates on my Rail or Bus Pass? You can change a train, bus or ferry travel date up to 48 hours prior to departure, subject to availability. Does a Rail or Bus Pass include the costs for bikes and extra luggage? No. The Rail or Bus Passes do not include the extra items like bikes, extra luggage, etc. You will need to book and pay for these costs separately for each train, bus, coach and/or ferry sector travelled. The cost for a bike or extra luggage on a bus, coach or train service is NZ$10.00 per travel sector travelled and NZ$15.00 per ferry sailing/crossing per item. Can I change names on my Rail or Bus Pass? A Rail or Bus Pass cannot be transferred to another person. How do I receive confirmations for my travel sector/s for my Pass? You will be emailed your travel e-ticket/Itineraries of your travel sector/s containing the departure dates, departure/arrival times and check-in times to the email address that was given in the original purchase of your Pass. When you receive your Pass it is your responsibility to check all details / dates are booked correctly. If you need to make changes to your ticket, please contact us immediately as space is limited and subject to availability. Can I turn up to the for any service with my Rail or Bus Pass and be guaranteed a seat? You can turn up to for any service with your Rail or Bus Pass numbers, however you are not guaranteed a seat on the train, bus or ferry service if you have not made a prior booking or reservation. Do I need to make reservation with my Rail or Bus Pass? A Rail or Bus Pass does NOT guarantee a seat on The Auckland to Wellington train, the Christchurch to Picton train or the Christchurch to Greymouth train, any regional or long distance bus services or foot passenger space on a Cook Strait ferry service unless a reservation has been made. How do I plan my journey ? Already Purchased your Pass ? If you have already purchased your pass and would like to Plan Your Journey, please select the My Booking tab on the main menu, and sign into your account - from here you can build your journey and save this to come back to later or submit your request to us so we can reserve your journeys and send your updated pass. Have not yet Purchaed your Pass ? If you have not yet purchased your pass and would like to build your journey and then work out what type of pass is best for your needs, simply start adding your journeys to the Journey Cart. You can then save your details by creating an account, purchase the applicable pass and then send us the journey details to reserve for you or submit your request and we can advise which pass best suits your needs. Not all journeys are included with the pass and these will display with addtional prices if applicable. All journeys are subject to availability and we will contact you should the service you have requested not be available. If you need any further assistance, please don't hesititate to contact us. What if my service is cancelled? Should your service be cancelled for any reason you will be contacted if there is time or advised when you turn up at the station. If a bus replacement can be organised, you will be offered this option. A processing fee as stated on your e-ticket will be charged on top of any fees imposed by the operator. * Bus Cancellations - New Zealand Travel Team charge a 10% Refund Processing Fee in addition to any charges applied by Intercity Coachlines on cancellations of all point to point bookings. A NZ$ 30.00 Refund Processing Fee will be applied to all tours. * Train Cancellations - New Zealand Travel Team charge a $30.00 per booking Refund Processing Fee in addition to any charges applied by Great Journeys of New Zealand on cancellations of all point to point bookings. * Ferry Cancellations - New Zealand Travel Team charge a 10% Refund Processing Fee in addition to any charges applied by InterIslander or Bluebridge on cancellations of all point to point bookings. * Rail/Bus Passes - New Zealand Travel Team charge a $100.00 per person booking Refund Processing Fee in addition to any charges applied by Great Journeys of New Zealand or Intercity Coachlines on cancellations of passes. 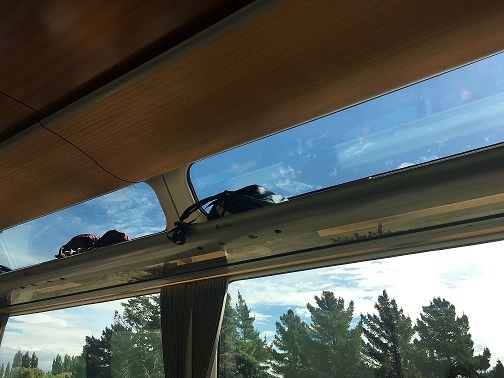 We are often asked about the space on the train for your carry on luggage, please see the photo below that shows that a small carry on bag is fine to place above your head in the main carriage. Can I get a Senior Discount on the Train? We are happy to offer a 10% discount for seniors on the train service off the Flexi Plus fare only, however often other fares will work out more beneficial to you if they are available. Enter Senior in the Apply Code box at check out prior to payment.